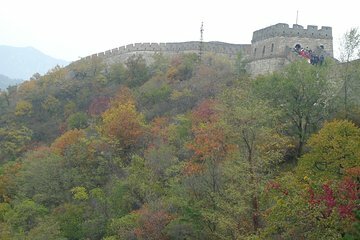 Geniet van de flexibiliteit van een privé-chauffeur / gids tijdens deze tour van de Mutianyu Great Wall, een populair stuk dat minder druk is dan Badaling. Geniet van een prachtig uitzicht over de heuvels terwijl u door dit UNESCO-werelderfgoed wandelt of kies ervoor om de kabelbaan of rodelbaan te berijden. Tour omvat retourvervoer vanaf uw accommodatie, het treinstation of zelfs de luchthaven. Jimmy picked us up on schedule from our hotel. He was very friendly and helpful. Jimmy's English was excellent. He made our day special. We could not have asked for anything more from this tour. I highly recommend Jimmy and this tour! Belle section de la grande muraille et Jimmy est super. il est passé nous chercher à lhôtel et nous a conduit. Il conduit prudemment ce qui est rare en Chine. Il nous a fait nous lever tôt pour arriver en avance et c'était une bonne chose, nous avons eu peu de monde sur le mur. OK this is a must do! we had the best time we went up in the lift and walked the wall then down on the tabogin, our guide let us go off once he got us our tickets and this was just what we wanted. Have to say this was a highlight of my whole holiday, do not miss the opportunity to do this. This was the absolute perfect way to spend our extended layover in Beijing. We arranged for the driver to pick us up from the airport at 6.30am to give us time to clear customs etc. He was easy to find at our arranged meeting place and he had a sign with our name on it. His english wasn't great, so he didn't talk to us much for the drive, which was fine as we were coming off of a 14hr flight. It took about 1.5 hours to get out to the wall and we paid for the chairlift and toboggan extras. We were at the wall by 8am and easily had the entire place to ourselves for almost an hour or so - it was incredible. We had arranged to meet our driver at noon at the shops at the bottom, and the crowds were definitely picking up at this point. Still nowhere near the levels we expected. Our driver then took us back to the airport with plenty of time for us to clear immigration and make our connecting flight. We had 11 hours total on the ground in China 4.30am - 5pm and it was more than enough time for us to make this trip. Highly recommend it!! Our tour guide was very knowledgeable about the history and very accommodating. Our guide had to wait almost 2 hours for us at the airport because we didn't account for the time it would take to get our day visas and yet he was very patient and understanding. Tip-go in summer, bring T.P. Jimmy enabled us to have a great day on the wall. The weather was superb for late December. He picked us up as arranged in a very nice car and drove in a very professional manner at all times. He was friendly and happy to let us spend all the time we wanted at the location. if you are looking for transport to the Wall or anything else then just book Jimmy. Very good value , you will not do better ! The service was perfect. The driver spoke a very good English, he was very kind and professional. Highly recommended. Perfect Great Wall trip. Jimmy was helpful and knowledgeable. He picked the four of us up at 8 am and we got there around 9:30. We climbed the steps to the wall which took about half an hour. A good workout but not a death march. Jimmy left us to walk along the wall by ourselves for a couple hours. There were lots of people but it was gorgeous and fun. We met back up with Jimmy at the toboggan and we took it down while he took the gondola. Unfortunately there was an incredibly slow woman in front of us on the toboggan so we barely got to go fast. But other than that no complaints. Jimmy took us to a nice place for lunch on the way home and helped explain a lot of the food.